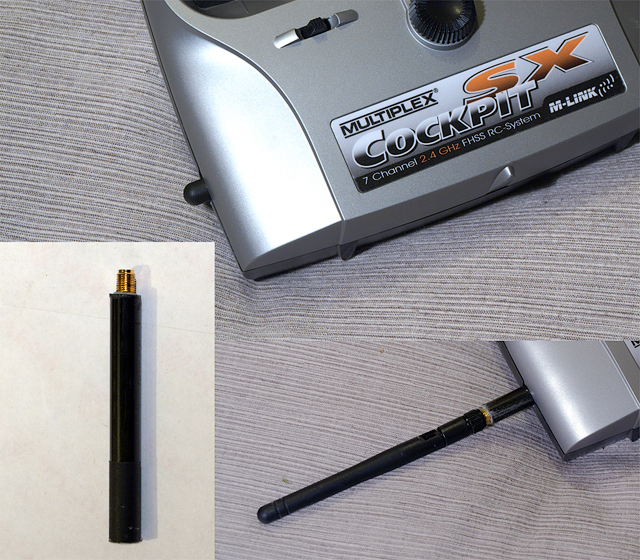 I was concerned that the antenna on my 2.4G Cockpit SX was a bit vulnerable if left mounted in a rucksack; yet it could be easily lost if carried separately whilst in transit. It dawned on me that using the stowage port for the 35meg aerial would be a zero or low cost solution. I butchered the aerial connector from an old PC wifi-card and epoxied this into a short length of 10mm dia carbon tube I had kicking around. You can pick up the aerial connector from Maplin: item code L61AZ "Reverse Polarity SMA Female" connector. Be aware however that the connector is officially rated at 500 cycles. If you're a particularly frequent flyer it may be worth investigating a mod which did not involve an additional connector, e.g. using a flexible tube to capture the exposed thread.